Underground reservoir models are needed to better understand the functioning of geothermal fields. Reservoir models use geophysical measurements to precisely understand the structure and functioning of the field. These include: gravity, resistivity, self potential and magneto-telluric methods. Modeling also depends on geological measurements including porosity, mineral grain density and bulk density. Gravity data is used for interpreting the structure of rock formations and alteration in rocks and minerals due to hot fluid flow. Structure close to the surface produces strong and local gravity effects that can be measured using spring-type gravity meters. However, deeper rock density contrasts produce weaker signals over wider areas and require much higher precision gravity measurements to model their structure. High precision gravity measurements could be used for detection of pore fluid changes for development monitoring; however, this has also been difficult to achieve with spring-type gravity meters. Since gravity depends on vertical position, GPS data is necessary to measure vertical deflection and achieves a precision of 3 mm or better. 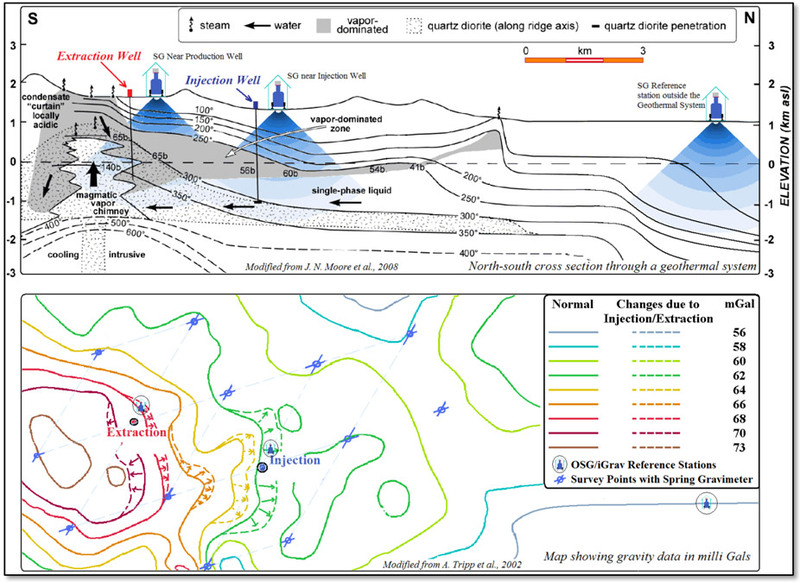 Independent of gravity, GPS cannot determine mass changes inside the reservoir, but provides supplemental information on deformation and subsidence to model a geothermal field for structural changes and mass flow of fluids. Gravity measurement campaigns using spring-type gravity meters are important in all stages of developing geothermal energy resources - from prospecting a potential site on through plant operation. In addition, some sites use absolute gravity meters (AG) in conjunction with spring-type gravity meters to improve precision. AG and spring-type gravity meters have limitations, which reduce the quality and reliability of their data. We propose that deployment of one or more superconducting gravimeters (SG), which continuously record high precision gravity variations, in conjunction with AG and spring-type gravity meter surveys will markedly improve gravity as a tool for geothermal applications. Spring Gravity Meters: Mechanical spring-type gravity meters have a repeatability that is typically 10 µGal and are designed to be portable and to make measurements quickly in surveys over a spatially defined network. In general, these meters are less expensive than SGs and easier to use. However, spring-type gravity meters are well known for their unpredictable drifts of tens of Gals to a few milliGals per day. In addition, their scale factor is not constant; drift rates may change dramatically in response to changes in pressure and temperature; and offsets or ‘tares’ may occur from mechanical shock. For these reasons, users often carry multiple spring meters to improve results. More recently, users have tied relative gravity sites to absolute gravity meter (A10 and FG5) reference stations to improve results. Absolute Gravity Meters: Absolute gravity meters are also designed to be moved and to make surveys, but cannot be moved as rapidly as spring gravity meters. The best absolute gravity meters (Micro-g FG5) achieve a precision of +/- 1 µGal, but are difficult to move and need at least 12 to 48 hours to achieve that precision. Therefore, the small field absolute gravity meters (Micro-g A10) with a precision of +/- 10 µGal are often used. Since absolute gravity meters cannot make continuous measurements, higher frequency information occurring between surveys is lost and correlation with other continuously monitored parameters is not possible. Continuous Gravity Reference Station: The iGrav™ SG meter provides a continuous high precision gravity signal for correlation with injection or extraction rates and other geophysical measurements. Continuous signal analysis techniques are extremely powerful for modeling and discriminating local hydrology from deeper geothermal signals of interest. SGs are built to run for decades with simple annual refrigeration maintenance cycles. Low Noise and High Precision: SGs have a precision of 0.2 µGal (Hz)1/2, which is more than 20 db lower than typical spring- type gravity meters. With a one-minute average, the SG attains a precision of 0.02 µGal. When placed outside the geothermal system, the SG provides a high precision gravity signal for referencing spring gravity and AG measurements and thereby improving their precision. Additionally, the SG can be used to determine a precise local hydrological model for extrapolation into the Geothermal field and to verify that Geothermal operations do not negatively affect the surrounding environment. Located inside the Geothermal system, the SG can provide continuous measurement of underground mass movement; and provide a precise reference point to anchor microgravity surveys. One achieves the advantages of continuous gravity measurements made both inside and outside the geothermal system. Enables measurement and subtraction of any common mode signals due to the Earth tides, ocean loading, atmospheric effects, and surface hydrology which improves precision and simplified interpretation of gravity data. Precisely monitors both regions of injection and extraction to directly monitor and optimize the utilization of the geothermal system. Sub-µGal resolution of gravity signals from underground sources by common mode rejection. Determination of rapid mass flow changes from injection and extraction. 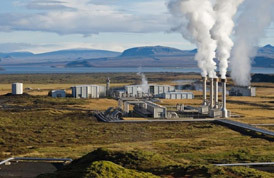 Determination of long term annual and decadal changes in the geothermal system. 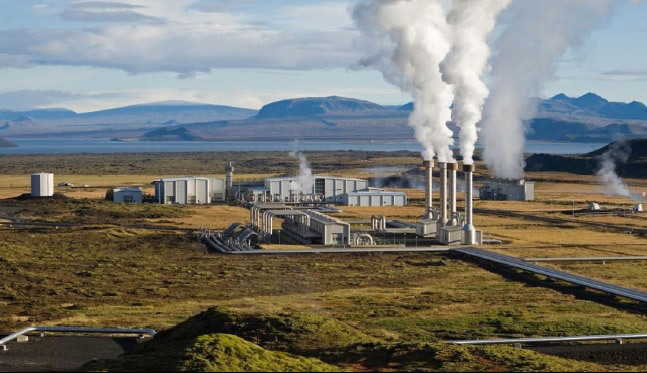 Optimum and sustainable production management of a geothermal system.